The holiday décor at The Bernards Inn this year is styled in festive shades of blush, champagne and classic Burberry-like plaid. Just as in my own home, picking a consistent color or ribbon to continuously weave from the entrance throughout the rooms of the home or the Inn creates a festive but not overdone styling for the season. Layering in lighting and a special touch of texture helps pull it all together. 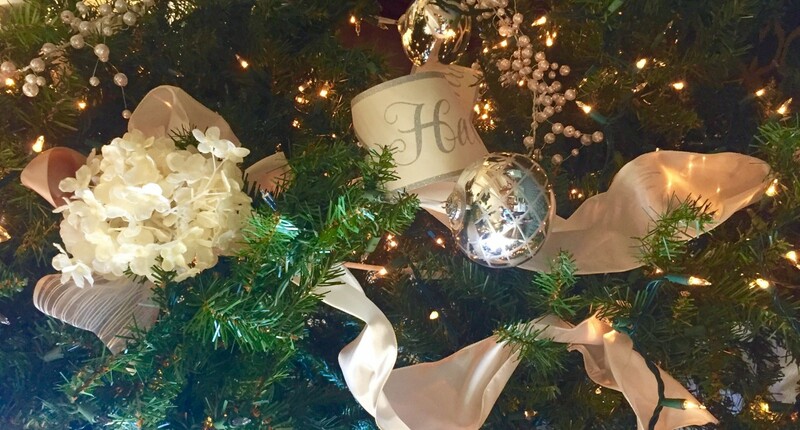 The Inn’s foyer and ballroom feature champagne and cream colored ribbons, silver-tipped white hydrangeas and magnolias, and white berried branches on the Christmas tree and throughout. Dashes of metallic, in keeping with the current design styles, are found on the poinsettia leaves, ornaments and ribbons. Perhaps my favorite personalized touch this season is the handmade blush colored bees wax candles. We had them made in a blush tone complimentary to the ribbons and dipped in silver to add a special sparkle when lit in the rooms. Keeping in mind that the ballroom will be used for weddings throughout the holiday season, these neutral and elegant touches remain classic to compliment any personalized wedding event. The Library Bar, Great Room and Conservatory desire a special warmth at this cold time of year. Rich amaryllis red, deep green magnolia leaves, traces of feathers and plaid ribbons enhance these rooms and add to the inviting space. I particularly love the black and white Burberry-like ribbons, metallic touched pine cone wreath and greens at play in the Conservatory. They flatter the classic black and white patterned floor and the newly added black and white Hollywood photographs which add classic fun. The theme of blush and metallic is carried downstairs into the Silver Vault with elegant evergreen boughs placed on the lanterns and cabinetry. Spotlighted arrangements feature the blush poinsettias and metallic leaves adding joyful appointments to the entertaining space.